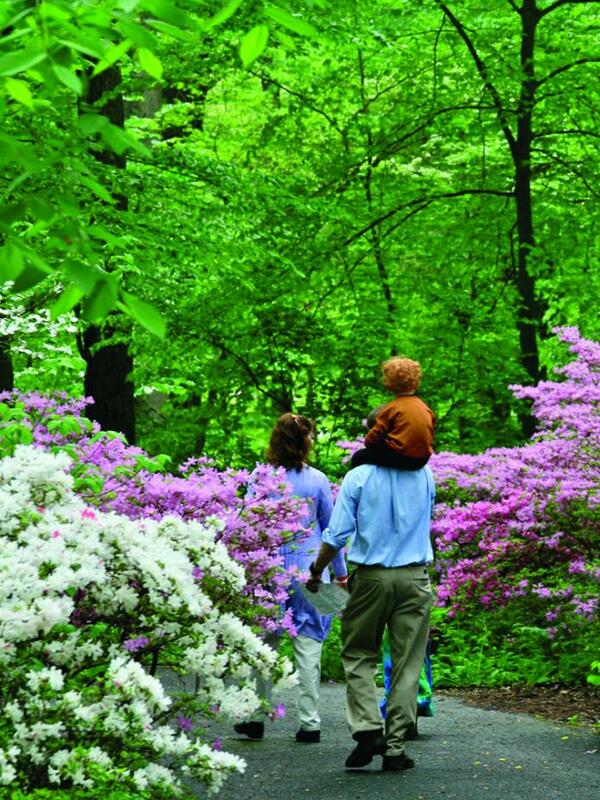 H. F. du Pont and generations of his family enjoyed walking the Winterthur estate. Today, Members, visitors, and staff all take advantage of the estate’s roads and walkways to experience nature up close and on foot. We encourage you to walk the estate and enjoy the garden, meadows, and woodlands throughout the seasons. 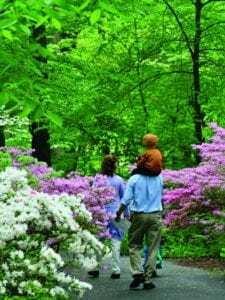 The following are some frequently asked questions about walking at Winterthur. Who can walk at Winterthur? All visitors are welcome to walk the grounds of Winterthur as long as they are wearing an admission tag or displaying their membership card. We encourage walkers to become Members to enjoy this activity on a daily basis. Where can I walk at Winterthur? When can I walk at Winterthur? Can I get a map of Winterthur that shows paths, roads, and trails? Yes. You can request a garden map at the Visitor Center or you can download a PDF of the Winterthur Estate Map. The map shows roads and paved paths as well as the locations of restrooms and emergency call boxes on the estate. The mowed paths in the meadow and woodland areas are not shown on the map, but you are welcome to explore them. Winterthur is nearly 1,000 acres. How many miles of roads are there at Winterthur? There are 10 miles of roads. Do Members have special access for walking? Members receive free general admission every day that we are open and are allowed to walk the estate from dawn to dusk. Please display your membership card when walking. Members may bring a guest using a guest pass to walk but must turn the guest pass in at the Visitor Center for an admission tag. After normal business hours, only Members may walk the grounds. Guests are only allowed access when we are open to the public. Can I picnic at Winterthur? Yes. Outside food and drink are allowed in the garden. No alcohol please. Be sure and use the waste receptacles provided. Please report your injury to our Public Safety office 302.888.4911. There are several emergency call boxes located on the estate (locations are marked on the Winterthur Estate Map). Can I walk my dog at Winterthur? Pets are not permitted in the Gardens, nor are there provisions to temporarily house them during a visit. Please do not leave dogs or cats in your car in the Parking Lot during warm weather since shade is minimal. Properly identified Service Dogs that provide assistance for visitors with disabilities are permitted. Can I arrange a walk for my club? Yes. Winterthur offers discounted rates of admission for groups. Please call 800.448.3883 or see our website for additional information. Can I pick wildflowers, collect mushrooms, collect rocks, etc. at Winterthur? Please don’t! We ask that our guests and staff members take only photographs and leave only footprints. We ask that you help us to maintain the natural habitat that exists here at Winterthur so that other visitors can continue to enjoy the beauty of our garden, woodlands, meadows, and wetlands. Please do not move or remove any natural or manmade materials from any part of the estate. What other rules of “garden etiquette” should I be aware of? Please don’t climb trees, stone walls, or other garden structures. Be aware that there are other guests in the garden and keep noise to a minimum (use headphones with MP3 players etc.). Walking and running are allowed, but other recreational activities such as bicycling, rollerblading, kite flying, ball or Frisbee playing, skateboarding, using scooters, or sledding are not allowed.